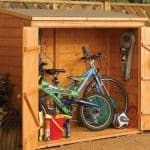 The 6 x 3 Rowlinson Deluxe Tongue and Groove Bike Shed is a fantastic storage solution for your family’s bikes. 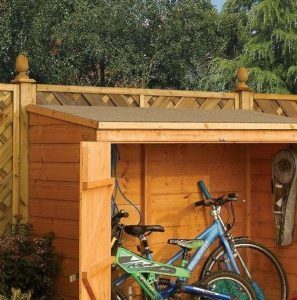 This compact and traditional wooden shed comes complete with wide double doors and is ideal for quick and easy access for bikes and their accessories. This 6 x 3 by shed has tongue and groove running all around it. This means you have interlocking pieces on the floor and in the cladding itself, which actively discourages rainwater from entering and seeping into the shed. There is a solid board roof that brings toughness and strength to the building, with mineral roofing felt on top of that to prevent rain access. The cladding is particularly pleasing, being as it is 12 mm tongue and groove, interlocking to protect your building. A 10-year anti-rot guarantee brings you an assurance that your building will last for a long time. 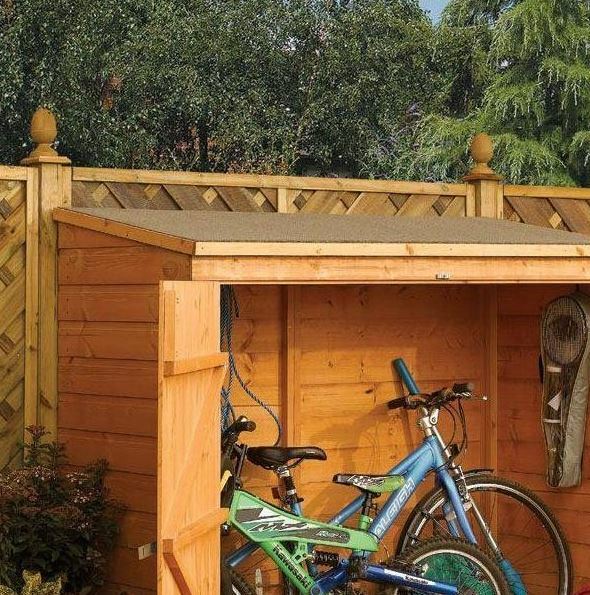 The shed is fully weatherproofed in order to protect your bikes from damp, mould and rusting. The wide double doors provide a full overview to the contents stored inside and easy everyday access to your bikes. With hooks on the interior, you may store all of your bike accessories in a neat and organised way. 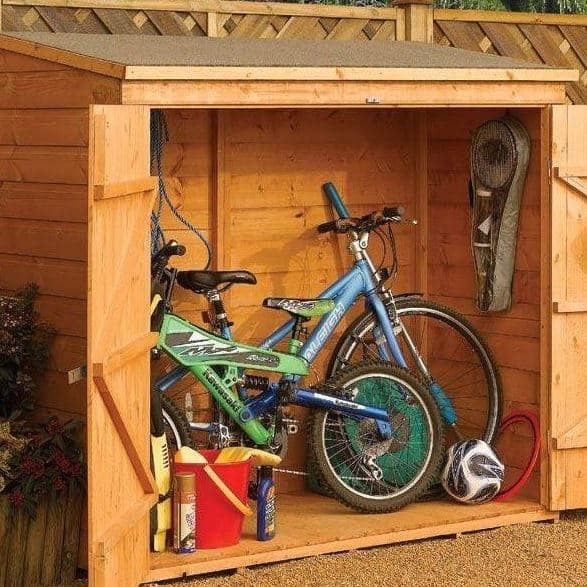 If you are looking at this bike shed then you are most likely looking for a shed with a specific purpose in mind – to store your family’s bikes and accessories. In that case you will have particular requirements that only a purposely designed bike shed may meet. In this section we have a further look in more detail at the different aspects and features of this deluxe bike storage solution. Exterior: The shed is constructed from 12mm shiplap cladding in a warm honey-brown tone that would look attractive in any garden. The building has a traditional feel, yet would also suit more contemporary styled gardens as it would blend into its natural surroundings well. Interior: With a 6x3ft interior, the shed has the capacity to store up to four bikes plus accessories. Helmets, tyres and other cycling accessories may be hung from hooks in the interior to leave the floor space for purely bicycle storage. 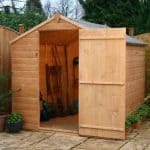 It is worth noting that the shed could be used for storage of other garden and outdoor equipment also. Doors: The doors are the full width of the shed, meaning that when opened the doors provide a complete overview of the interior contents. Items are easier to locate and, most importantly, quickly accessible for regular usage. Security: In order to provide your bikes with the level of security that they require whilst being stored outside, the double doors are lockable and a padlock is available to purchase as an additional extra at a small cost. A deluxe shed alarm security kit is also available at a very reasonable price, should you wish to store more expensive bikes and equipment. 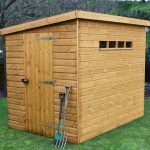 6 x 3 Rowlinson Deluxe Tongue and Groove Bike Shed: How easy to build? Due to its lower height and generally smaller size, it may be possible for an individual to assemble the bike shed by themselves. However, it is recommended that two people assemble the building together for safety reasons and time efficiency. The shed will be supplied in flat-pack form with all the necessary fixtures, fittings and roofing required for easy assembly. The process is straight-forward, with a detailed and easy-to-follow instruction manual included. We expect that this bike shed could be assembled within a few hours by those with some basic DIY knowledge. 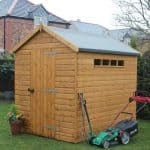 6 x 3 Rowlinson Deluxe Tongue and Groove Bike Shed: What is the overall quality like? This model of bike shed is designed and manufactured to provide a dry and secure storage solution for both bikes and their accessories. The walls and floor are constructed from 12mm shiplap cladding that gives the building structure strength and a long life. 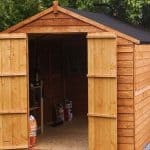 The shed carries a 10 year anti-rot guarantee from the manufacturer as long as it is well maintained and treated on an annual basis. It should be noted that although the shed does come with a floor, it is recommended that it be assembled on a flat, level base to ensure that the building stands firm. The building as a whole is designed and built to protect your bikes and equipment from the elements, as well as damp, mould and rust. The roof is constructed from 9mm solid sheet board with a heavy duty mineral felt covering, ensuring the roof is both durable and fully waterproof. 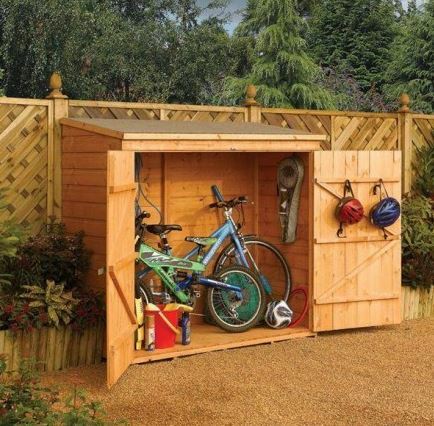 The 6 x 3 Rowlinson Deluxe Tongue and Groove Bike Shed is an ideal storage solution for those with bikes, trikes, scooters and accessories to store. 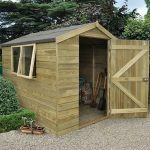 This neat shed has an attractive timber cladded exterior and proves to be both pleasing to the eye as well as extremely practical on all counts. Wide lockable double doors and easy accessibility, everything you desire in a storage solution for your family’s bikes. 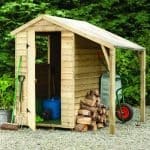 A fantastic shed at a fantastic price!